Planksy Gives Thanksgiving Day Planks, Thanks. Ahoy, mateys. Arrr! It’s none other than yer grand bird of yore, the bird with yer word, Plansky the pirate turkey, fillin’ in for DocHoc this tofurkey day of cheer and thankfulness. I be sailin’ in the Sooner state via the grand rivers of Washington state and Colorado, and I be making “smokin'” grand time if yer get me drift, loaded to the gunwales, lads and lasses. Arr, buccaneers, now on the Oklahoma River, me crew 300 fowl strong, shiver me timbers, I bring ye me annual planks and thanks. If yer a scurvy, lily-livered scallywag, then ye get to do yer walk on me wooden planks. If yer a pirate with the pirate stuff, ye get me thanks, a cup of me finest rum and some hornpipe dancing on board with the loveliest bird around, me, Planksy, with me gobbler swashbucklin’ gingerly in the brisk Oklahoma wind. Planks. Name me a scurvy landlubber that denies health insurance to poor people, and I’ll give ye a lass without a heartie, mateys. Arr! Me first planks go to Gov. Mary Fallin for tellin’ Oklahoma’s poor to take a black spot-Davey Jone’s locker if ye catch me drift-and don’t bother to keep in touch. By denyin’ the federal Medicaid expansion, governor, ye flew yer true Jolly Roger. Go feed the toothy fishies, Mary, and take a second look at what ye done for pirate’ssake. Thanks. Yo-ho-ho. Oklahoma’s got its true swashbucklin’ pirates, fightin’ fer truth and justice, a squadron of the rational, buccaneers of logic. Arr! They, me mateys, even believe in countin’ for pirate’ssake! So thanks go to the Oklahoma Policy Institute for holdin’ the Oklahoma Legislature and government accountable and, aye, sayin’ what fer to pirates and scallywags alike. Here’s me rum, mateys, held on high by the grandest pirate turkey wing ever to grace the universe, and me beautiful beak proclaims, with accompanyin’ hornpipe and fiddle music: A toast, me swashbucklers, nay no no, a grandest wish, fer another good year. Planks. Arr! It shivers me timbers to no end to see so many of me Okies mark their ballots fer scurvy scallywags who don’t care a doubloon fer gentlemen of fortune like themselves. Mitt Romney, yo-ho-ho, why the scallywag insulted half me fellow Okies in his campaign. The bilge rat thinks yer scurvy if you don’t got the do-re-mi. So me planks this season go to Mitt supporters here in Oklahoma. Arr! Thanks. Aye, in the opposin’ looksee, me thanks go to me Okies, more than 400,000 strong swashbucklers, a good-lookin’, intelligent crew fer sure, who went fer yer one and only Barack Obama, a treasure above the sea. Pirates galore, ye are not alone on the red-dirt prairie, and me ship sails with ye and fer ye as sturdy as she can be and as long she lasts. Efstoons, prepare the cannons, draw yer swords and wave the Jolly Roger. Arrr! The progressive fight goes on here. A cup of me rum from the special barrel to ye, a little dancin’ to me hornpipes and then let’s get with the pirating and general mayhem before we go to Fiddler’s Green. Thanks. Arrr! From his shapely legs to his stunnin’ wings, from his piercin’ intelligent eyes to his gobbler a sway, there’s no other bird quite like him in the universe. Aye, me lads and lasses, me final thanks go to meself, Planksy, during this time of thanks. I thanks thee, Planksy, aye, I thanks thee. Arr! 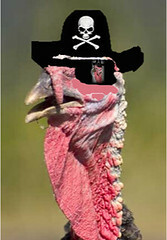 I wish all me hearties a happy Thanksgiving, with all the trimmin’s and good cheer on board yer ships. Get yer pirate on, buccaneers, but be safe. I definitely recommend the tofurkey.